Was Gingrich Correct On His Record As Speaker? Fact-Checking the GOP Debate : It's All Politics Newt Gingrich used one of his favorite talking points, that when he was speaker of the House, he "balanced the budget for four straight years, paid off $405 billion in debt." But PolitiFact checked the numbers and found he's off on both counts. The Fox News debate Thursday night offered the Republican presidential candidates something of a closing argument with less than three weeks until the Iowa caucuses. The debate included an interesting offering of factual claims, many of which sounded familiar to us. The most provocative was one from Rep. Michele Bachmann about ... us. 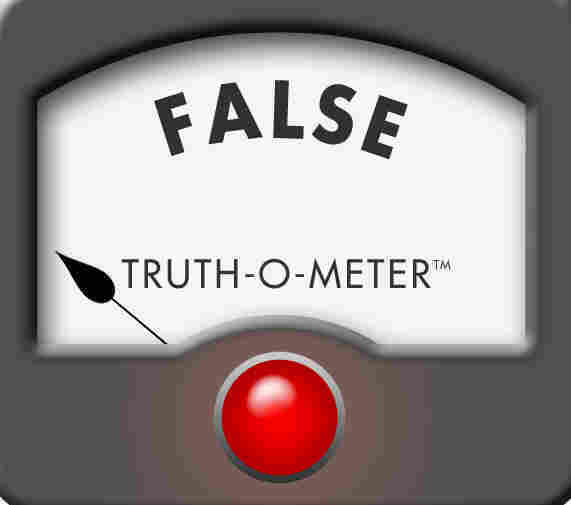 Bachmann cited PolitiFact in response to a complaint from Newt Gingrich that she wasn't being accurate with a claim about his work for Freddie Mac. Bachmann said: "After the debate that we had last week, PolitiFact came out and said that everything I said was true." But in fact, Bachmann earned two ratings from us at that debate, a Mostly True for her claim that Newt Gingrich advocated for the individual mandate in health care and a Pants on Fire for her claim that Mitt Romney set up a health plan in Massachusetts that is "socialized medicine." Newt Gingrich spent much of the debate emphasizing his conservative credentials to rebut arguments from Bachmann and others. He used one of his favorite talking points, that when he was speaker of the House, he "balanced the budget for four straight years, paid off $405 billion in debt." But we checked the numbers and found he's off on both counts. We rated that claim False. Jon Huntsman, who has been talking about the need for energy independence, repeated a claim he had made before in New Hampshire, saying that "in this country ... we have more natural gas than Saudi Arabia has oil." We don't, although we currently produce more natural gas than Saudi Arabia produces oil, so we rated it Mostly False. For more political fact-checking, you can tune in on Saturday morning when Bill Adair joins Weekend Edition to discuss how candidates are fairing on the truthfulness scale so far this election season.